The Supreme Court of Appeals has ruled for the return of a property seized from a Greek family in Istanbul decades after a lengthy legal battle by the sole heir of the family. The land currently owned by the Treasury was seized in accordance with a court verdict that restricted minorities' rights to ownership of real estate. It used to house a mansion originally owned by the brother of Maksimos Vapurci, a former Fener Greek Orthodox patriarch, who co-inherited it with his other brother Yani Vapurci following the death of their elder brother in 1971. After the deaths of the patriarch and his brother in the 1970s, the mansion and its land were inherited by Yani Vapurci's wife Kornilla. In her will in 1982, Kornilla ordered its transfer to her adopted son Stamatis Papamanolaki after her death. The Turkish Treasury applied to the court to handover the mansion and land, under a 1964 legislation that restricts minorities' right to ownership. In 1985, the ownership of the land by Vapurci was cancelled by a court ruling, thus the plot and the mansion were transferred to the state. The mansion was destroyed in 1986 and a mosque was built on the land in the following years. Papamanolaki applied to the court in 2008 for the return of the property. After a legal battle, the case was assessed by a board of the Supreme Court of Appeals which ordered examination of reciprocal regulations with Greece, as Papamanolaki is a Greek citizen, and found his right to ownership was in line with the reciprocity agreement between Turkey and Greece, finally awarding the plot to the Greek national, who moved to Greece after residing in Turkey for a number of years. 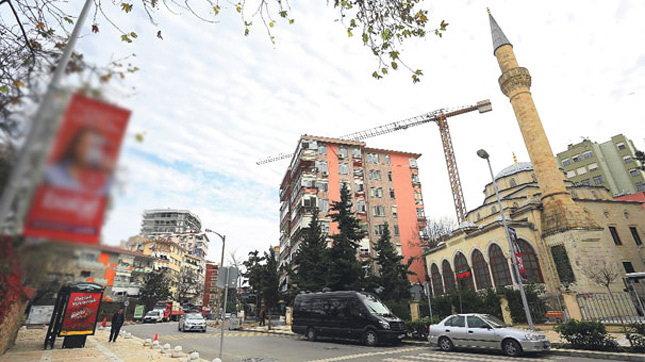 According to the Milliyet newspaper, the 92-year-old Papamanolaki will not seek the demolition of the mosque on his land but will appeal to the court for compensation and if approved, would return the plot, with the mosque, to the Treasury.